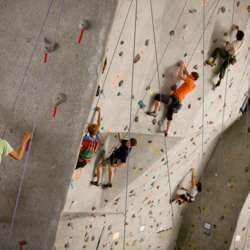 If you haven't tried indoor rock climbing, it is not as scary as it looks. However, it does require a reasonable level of fitness and strength. We have arranged for a 'beginners' introductory session, where we will be given 1.5 hours instruction, and left to climb for 1.5 hours (3 hours in total). Wear clothing that you normally use in the gym (shorts and T-shirts are perfect)!